A reality of today’s global economy is large, middle market and even small companies need to gain access to global markets. Seventy percent of the world’s customers are outside of the United States and U.S. exports account for 12.5 percent of the nation’s gross domestic product. More importantly, U.S. companies that export grow faster and are less likely to go out of business as compared to non-exporters. Companies, regions and states are either global economic winners or losers and launching export campaigns are the key to winning in the global economy. The Chinese economy is closing in on the American economy in terms of production and purchasing power. However, the Boston Consulting Group estimates American manufacturing costs are now within 5 percent of Chinese costs due to rising costs in Chinese production. The Wall Street Journal reported China now has more millionaires than all nations’ but China’s restrictive monetary policy makes it challenging for money made in China to leave China. Rising production costs and massive wealth accumulation prime China for American exports. Middle market companies face unique challenges and opportunities when considering an export strategy. 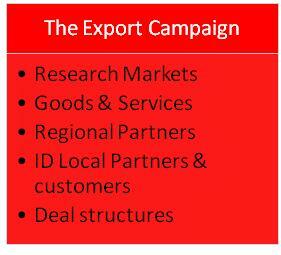 However, those middle market companies successfully launching an export campaign receive great rewards. According to the Export-Import Bank (Ex-Im Bank), 287,000 U.S. small businesses accounted for 98 percent of all identified exporters. Launching an export campaign at a middle market company has many challenges but identifying financing for this operation may be tops on the list. A range of state and federal government sources of financing exist to fund a company’s export campaign. State governments are the place to start when it comes to financing export campaigns. The Ohio International Market Access Grant for Exporters (IMAGE) provides a 50 percent reimbursement up to $10,000 per year to small businesses looking to increase exports and create jobs. Ohio companies manufacturing or distributing Ohio based products to global markets are eligible for funding. These small grants are awarded competitively based upon an application that measures the company’s knowledge of global markets and likelihood of success. IMAGE grants are only the start of state funding for exports. Millions of dollars in state government grant and financing can be secured by negotiating a larger economic development tax incentive package if the company is considering relocating or expanding state operations and/or creating jobs and making a capital investment. Exporting companies are generally growing companies and export operations can be tied directly to economic expansion plans that provide low interest government loans, grants, tax credits and tax abatements in nearly all 50 states. The federal government is also a prime source of export campaign funding. The Ex-Im Bank is an independent U.S. government agency that facilitates the export of U.S. goods and services by providing export credit insurance, loan guarantees to lenders, direct loans to exporters on market-related credit terms and loans to foreign buyers. Ex-Im Bank’s insurance and loan guarantees reduce the commercial risks (such as buyer insolvency and failure to pay) and political risks (such as war and currency inconvertibility) of international trade. The working capital guarantee enables lenders to provide the financing that an exporter needs to purchase or produce a product for export, as well as to finance short-term accounts receivable by guaranteeing 90 percent of select loans for most eligible companies. Finally, the Ex-Im Bank offers export credit insurance to offset the commercial and political risks that are sometimes associated with international trade by protecting an exporter’s short-term credit extended for the sale of consumer goods, raw materials, commodities, spare parts and other items for which payment is expected within 180 days. If the buyer fails to pay, Ex-Im Bank reimburses the exporter in accordance with the terms of the policy. The Small Business Administration (SBA) also provides financial assistance to U.S. exporters through its Export Working Capital Program (EWCP) that guarantees up to $1,500,000 or 90 percent of the loan amount. These loans provide working capital for export transactions and finance export receivables, support standby letters of credit used as bid or performance bonds and can be set up to support individual transactions or as revolving lines of credit with negotiated interest rates. The SBA’s International Trade Loan Program guarantees up to $1,250,000 in combined working capital loans and loans for facilities and equipment (including land and buildings; construction of new facilities; renovation, improvement or expansion of existing facilities; and purchase or reconditioning of machinery, equipment and fixtures). The SBA Export Express Program expedites multipurpose loans for small businesses through approved lenders up to $250,000. Loans of up to $150,000 receive an 85 percent SBA guarantee and loans over that amount receive a 75 percent SBA guarantee for qualifying companies focused on export related activities. While a hot topic of debate in the Congress, the success of public sector financing for export related activity is clear. During fiscal year 2012, the Ex-Im Bank supported about 255,000 U.S. jobs and reported a fourth-straight record-breaking year with $35.7 billion in authorizations and more than $50 billion in sales supported. Over 3000 of the small companies gained $6,100,000,000 in financing in 2012 from the Ex-Im Bank, and the SBA supported more than 2,400 loans to 3,500 small businesses supporting $3,400,000,000 small business sales during 2012. Negotiating state and federal government financing requires a team of professionals and export financing needs to be tied into large economic development incentives and an overall export campaign to maximize chances for success.